The crowd chanted slogans such as "Quebec, it's our home!" as they marched against the legislation that would ban the wearing of religious symbols on the job for public sector employees deemed to be in positions of authority, including teachers, judges and police officers. 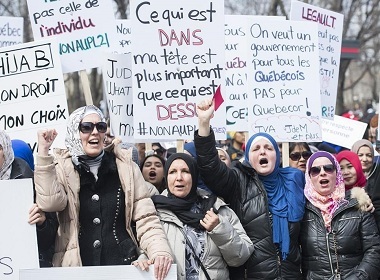 The protesters included Aymen Derbali, who was seriously injured in the January 2017 Quebec City mosque shooting where six Muslim men were killed. Derbali, who attended with fellow survivor Said El-Amari, told the crowd that rather than working to reduce stigma and Islamophobia, the government is tabling discriminatory legislation that unfairly targets Muslim women. "Instead of weighing in on societal problems, (the Legault government) wants to adopt a law that oppresses the rights of women to wear their hijabs and to work," said Derbali, who was partly paralyzed in the shooting and now uses a wheelchair. Taran Singh, a member of Montreal's Sikh community, said the government should focus on issues such as the school dropout rate and hospital emergency room wait times rather than pitting Quebecers against each other. "What the political parties in Quebec are doing is dividing us," Singh said. "Anglophones against francophones, federalists against sovereigntists, laypersons against religious immigrants. "This mentality of us versus us doesn't serve anyone." Selsabil Hamiham, a 21-year-old student, said the proposed bill attacks her identity. "I don't believe Francois Legault has the power to tell me how to dress, how to be," she said. Wearing a hijab was her own choice, she added. "Since nobody forced me to wear it, nobody can make me take it off," she said. Sunday's event was the largest of a series of protests that have been held to denounce the legislation, known as Bill 21. The crowd included representatives from many of Montreal's cultural groups, including the Muslim, Sikh, Jewish and Chinese communities. The event was organized by Adil Charkaoui, a controversial Islamic educator who was once accused by Ottawa of having terrorist ties. Charkaoui was arrested under Canada's security certificate system in 2003, but he was never charged. On Sunday, he called on Quebecers to reject the bill, which he said aims to tell Muslim women how to dress and where to work. The Quebec government argues the bill is reasonable and in line with the values of Quebecers, and last week Legault said it doesn't violate religious freedom. People who would be excluded from public sector jobs because of the law can find other work, he said.